Beach School has now earned the International Baccalaureate (IB) authorization for the Primary Years Program (PYP)! Beach School is one of only 4,267 schools world wide that offers the IB program; 1,685 in the United States. Of those U.S. IB schools, there are only 493 that offer the Primary Years Program and Beach School is now one of them! 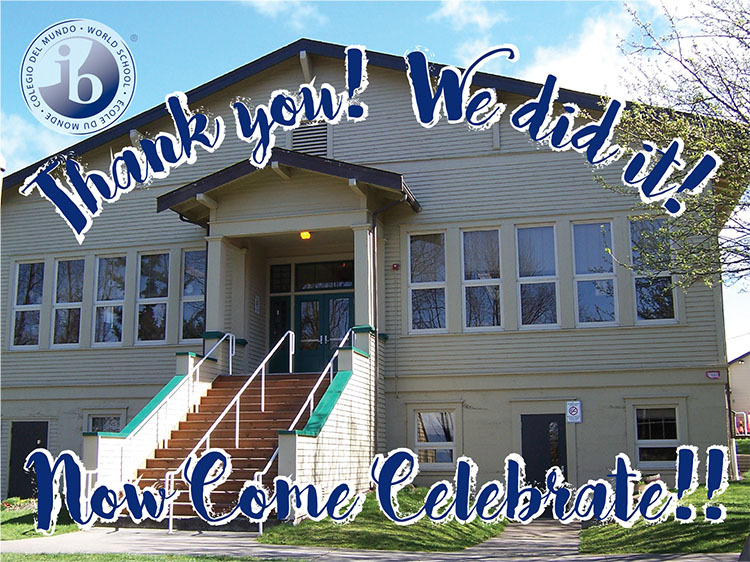 We think Beach School may be the smallest school to have earned the IB authorization (we're checking that fact) but one fact we don't have to check: our community is one of the proudest! We love our International Baccalaureate public community school! Thank you Lummi Island! As an IB school, we share a common philosophy—a commitment to high quality, challenging, international education that Beach Elementary School believes is important for our students. We are excited to bring the IB mission statement to life here on our wonderful Island: The International Baccalaureate aims to develop inquiring, knowledgeable and caring young people who help to create a better and more peaceful world through intercultural understanding and respect. To this end the organization works with schools, governments and international organizations to develop challenging programs of international education and rigorous assessment. These programs encourage students across the world to become active, compassionate and lifelong learners who understand that other people, with their differences, can also be right. Thank you Lummi Islanders and here we come IB! Learn more about the IB and its programmes. Ellen Alquist, served as Beach Elementary School's PYP Coordinator during all three years of the authorization process and for the first year as a fully authorized school. Ellen has been an IB/PYP consultant for years. Ellen is a member of the original team who created the Primary Years Programme of the International Baccalaureate. One of the original trainers for the programme and one of the original trainer of trainers, she now consults with schools in Europe, North America, and the Middle East who are interested in becoming PYP schools, as well as with schools that are already following the PYP curriculum. When the PYP was first being established, Ellen co-authored and edited the PYP mathematics curriculum, and developed and taught the teacher workshops that expanded the idea of using inquiry to teach mathematics in primary schools. She was chairperson of the assessment committee and co-authored the original assessment handbook for the PYP and then developed and taught the original assessment workshops. Ellen works as an educational consultant throughout the United States and around the world. At Beach School, Ellen provides specific, classroom-tested ideas for reaching children with every learning style. A firm believer in differentiated instruction, Ellen is inspiring every educator at our school. Ellen worked with our teachers to refine their skills in delivering the PYP, especially in improving their use of inquiry in literacy and numeracy. She helped our teachers and administrators to develop units of inquiry that will excite our students’ imaginations and empower them to search for answers to their questions. With considerable experience in authentic assessment and evaluation techniques that give a true picture of students’ understanding, Ellen helped our teachers learn to measure our school’s success in more meaningful ways. She taught us how to develop better assessment and evaluation guidelines so that our grading and reporting system is an accurate reflection of what our school believes in. Ellen worked with our teachers, creating a robust Exhibition framework for our students’ final year in the PYP. The Exhibition is the ultimate in authentic assessment because it asks the student to provide evidence of the effectiveness of the school’s PYP Programme through a unit of inquiry where he or she is the primary thinker, leader, and investigator. We are so grateful to have had Ellen on our Beach School team! Mark Hall is Beach School's new Principal and PYP Coordinator. Please visit our site again soon for information about Mark Hall or visit Ferndale School District website to learn more about Mark. In order to sustain our beloved island school, we are seeking creative ways to attract more students. As of April, 2013 with the support of the Ferndale School District, the Beach School PTO and our Community Partners (FOIL, LICA, The Heritage Trust, Lummi Island Grange, Puget Sound Restoration Fund and the Commercial Street Theater Project) the Lummi Island Foundation for Education has officially filed the application and paid the application fee for Beach School to become an International Baccaluareate Candidate School as of September, 2013. LIFE and the PTO have both hosted community meetings featuring speakers such as the former Principal, PTA members, the IB Coordinator and a teacher (Lummi Island's very own Joe Anderson!) from IB World School Wade King Elementary in Bellingham. Here is some basic information about the program as well some of the Q & A from previous community meetings. For the Q & A from the most recent PTO meeting which featured guests related to the IB program, please visit the PTO EVENTS page. First, some history: the International Baccalaureate® (IB) was founded by a group of forward-thinking teachers at the International School of Geneva in Geneva, Switzerland in 1968 as a non-profit educational foundation. What started life as a single program for internationally mobile students preparing for university, has today grown into three programs for students aged 3 to 19 working with 3,490 schools in 144 countries - approximately 1,064,000 students. These programs (the Primary Years Program or PYP; the Middle Years Program or MYP; and the Diploma Program or DP) can be offered individually or as a continuum by IB World Schools. The PYP, for students aged 3 to 12 started in 1997 and is now offered by 982 IB World Schools. Question: what about the State Standards? The PYP frames the learning activities of the school community. This framework is can incorporate curriculum requirements. The traditional disciplines retain a role in the IB PYP. The six specified subjects are language, mathematics, science, social studies, arts, and personal, social and physical education. International-mindedness is encouraged in IB students. To do this, IB schools teach that students must first develop an understanding of their own cultural and national identity. All IB students are required to learn a second language and the skills to live and work with others internationally, essential for life in the 21st century. Question: might such a program be an extra burden on our teacher (s)? Because these programs were written by teachers, the PYP is deliberately constructed to allow teachers freedom to innovate and contextualize learning in their unique school. In fact, IB programs are based on a high level of trust in teacher professionalism. Additional training for teachers is required. These training hours do count towards required teacher training hours. There is plenty of flexibility for teachers to draw on the rich variety of their educational traditions and and to harness their hard-won professional knowledge. Question: specifically how does the IB program support the teachers? All teachers in IB World Schools have access to the online curriculum center, which provides program documentation, examples of student work, and also acts as the hub of an international online community. Teachers can talk to other teachers in IB World Schools around the world (imagine being able to access 30,000 teachers from over 120 countries!) and give and receive advice, and post their own example resources for other teachers to share. The Online Curriculum Center is organized by curriculum area, with additional areas relating to librarians, special educational needs, academic honesty and research. Professional support is available in all parts of the curriculum and in cross-curricular areas such as special educational. Question: is this a program that reaches kids, regardless of economic background? Yes. IB is used in national and international, public and private schools. These IB World Schools form a worldwide community in which there is no such thing as a “typical” school; in the United States, more than half (56%) of IB public schools (IB World Schools or candidate schools) were designated Title I. Of that 56%, the majority (71%) are Schoolwide Title I. IB works to develop a more diverse, inclusive IB community by enabling access to an IB education regardless of personal circumstances so that more students have opportunities to benefit from a high-quality international education experience. Question: what makes the IB program so unique? The most significant and distinctive feature of the PYP are the six transdisciplinary themes of global significance (who we are; where we are in place and time; how we express ourselves; how the world works; how we organize ourselves ; sharing the planet), explored using knowledge and skills derived from six subjects areas (language, mathematics, science, social studies, arts, and personal, social and physical education) and focuses on the development of the whole child as an inquirer, both in the classroom and in the outside world. Each theme is addressed each year by all students; the themes provide the opportunity to incorporate local and global issues into the curriculum. Again, the traditional disciplines retain a role in the IB PYP. The six specified subjects are language, mathematics, science, social studies, arts, and personal, social and physical education. The overall expectations for each subject area are defined for each year of the program. Form: What does it look like? Change: How does it change over time? What are the PYP trans-disicplinary skills? Thinking: Acquisition of knowledge; comprehension; application; analysis, synthesis, evaluation, dialectical thought, meta-cognition. Social skills: Accepting responsibility; respecting others; cooperating, resolving conflict; group decision-making; adopting a variety of group roles. Communication skills: Listening; speaking; reading; writing; viewing; presenting; non-verbal communication.